Diamonds are born under pressure, being committed to an idea have presented some challenges. Attitude and vision are fueled by determination, without it an ordinary attitude would have given up. Nothing without true "sacrifice" happens overnight. "Verily after difficulty comes ease"
Cultivate your idea with consistent effort and observation of the game or industry you're within. Over time personal areas of expertise will grow and wisdom will deepen becoming useful. Align your purpose alongside or join supportive social networks of progressive thinking people. Colleagues, mentors and friends who can suggest, point and/or stimulate (motivate) the work, giving us a honest opinion and plenty constructive criticism. Do not be too sensitive, thick skin is a requirement. Remember "tough skins" break'em out they will come in handy, with the patch! 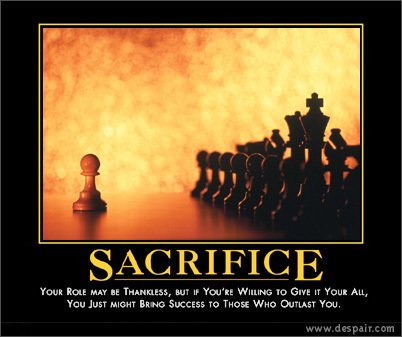 "Sacrifice" a word all of us know on many different levels; family, work, relationships or an idea worth enduring. The work, can be misunderstood by others if they are not included or have excluded themselves from its trials of transition; subsequently not wanting you to follow. "plant a seed and pray for rain"
Rewards are found within an evolution of consistent work on a relentless level. If there is no effort there is no action. "All actions are but by intentions" a prophetic statement, made by a prophetic man. The intention contains 3 components; its volition, purpose, and determination; the key is living in the realm of each. Motivation from sound sources is vital, mainly for comfort and support. Which nurtures our mental health for balance and is necessary energy powering strategy and strengthens the heart. Success simply arrives through an arduous process. The reward is through endurance of time, chosen for worthy recipients to enjoy. "Can you hear a flower grow or do you watch a flower grow?" It could be misunderstood as pure selfishness - then what about; then what about Wright Bros during their consistent attempts, Betty Shabazz during times of hardships or that single mom/dad and their description of sustainability to endure their daily sacrifice. Are they even comparable to each other. Try taking the time with those who you know or see are in a struggle for goodness. Let's learn how to reach our dreams from who are not dreaming. I love the theme of this weeks wisdom wednesday...I can really appreciate everything you said....so motivating for those of us who need a little kick start to get back into the game of life. Not much thats worth having is without having to work hard for it, but everything is so "easily" accessible at our fingertips, literally, that were very lazy when we encounter opposition. I'm so guilty of this!!!! Very good insight you gave about sacrafice aiding in our personal development, as well the importance of developing a thick skin. Thank you so much for these insights and wisdom. This was soooooo good for me at this time in my life...for real-for real,lol! Peace and blessings and looking forward to some good wisdom next week! Appreciate you, our intention is simply to be relevant through our personal experiences. Your comment is confirmation we are on track and relating with our audience. Thank you and please share Create-A-Voice using the share buttons - Peace!